2014 Call to artists is now open! Our call to artists is open until APRIL 5th 2014 so get those submissions in!! Amazing things going on down in Portland. Our friends Portland Street Art Alliance and One Grand Gallery have brought JR’s Inside Out Project to Portland. On Saturday, November 30th, 2013 a group of community members transformed the wall of K+F Coffee Roasters (alongside the train tracks of inner SE in the Brooklyn neighborhood) into a people’s public art gallery. PSAA helped install and document the wheatpasted mural. One Grand, a contemporary art and design gallery in Portland, organized the city’s first JR Inside Out Project, with the theme of “Keep Portland Weird.” The Inside Out project involves an organizer choosing a theme, proposing the project to JR, taking photos of local community members based on that theme, sending those images to JR who prints them out and sends them back, and then the community comes together again to paste the portraits in public spaces around the city, creating massive collages that literally put a human face on our urban environment. This is global art project has been carried out by citizens of hundreds of cities across the planet. We see this as a great way to involve the larger community in the production of street art, helping to teach people about the process and demystify some of the misconceptions about street art is an illicit and illusive activity. This project shows that anyone can impact their environment and get involved with public space interventions. 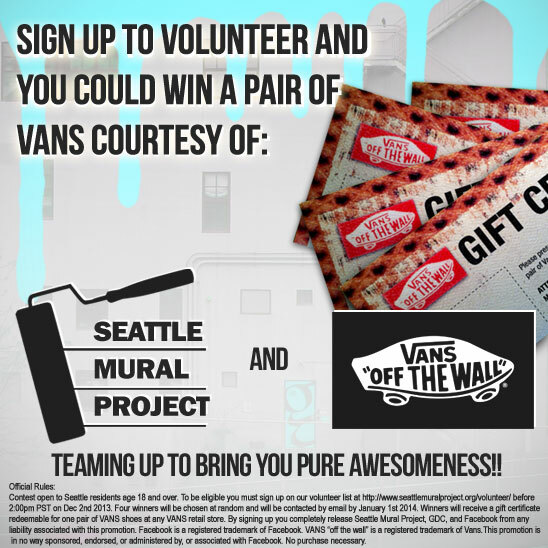 Sign up to volunteer for a chance at winning shoes courtesy of VANS! 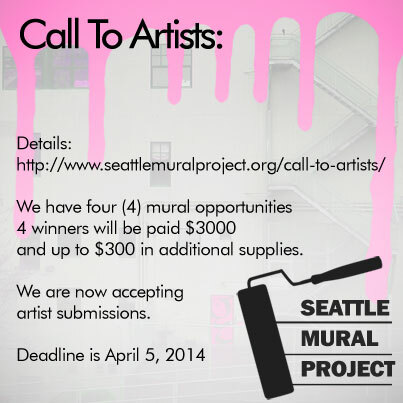 We need your help to support Seattle Mural Project. The City is asking that we show current volunteer interest in our project and that means we need people to sign up ASAP to show The City of Seattle that folks are still interested in giant murals on Capitol Hill. To show our thanks we are teaming up with VANS to give away a pair of shoes to 4 lucky winners. All you have to do is to sign up for our volunteer list to be entered and be eligible for the drawing. Signing up does not obligate you to volunteer. Thanks and Good Luck! The deadline for entry is Dec 2nd 2013 at 2:00pm PST. Go Here to sign up now! Contest open to Seattle residents age 18 and over. To be eligible you must sign up on our volunteer list at http://www.seattlemuralproject.org/volunteer/ before 2:00pm PST on Dec 2nd 2013. Four winners will be chosen at random and will be contacted by email by January 1st 2014. Winners will receive a gift certificate redeemable for one pair of VANS shoes at any VANS retail store. By signing up you completely release Seattle Mural Project, GDC, and Facebook from any liability associated with this promotion. Signing up to our volunteer list does not obligate you to volunteer. Facebook is a registered trademark of Facebook. VANS “off the wall” is a registered trademark of Vans. This promotion is in no way sponsored, endorsed, or administered by, or associated with Facebook. No purchase necessary. We need your help to secure our funding! Sign up to volunteer. We need your help to support Seattle Mural Project (Formerly Stunning Seattle) (and don’t worry, we’re not asking for money). Without your help we may be in danger of losing our city funding. The City is asking that we renew our volunteers and that means we need people to sign up ASAP to show The City of Seattle that folks are still interested in giant murals on Capitol Hill. It will only take you a minute and it’s totally easy. There is no obligation for signing up and in doing so you will tell The City to move forward with this great project. We know that the summer of 2014 is eons away but The City is requiring this of us ASAP. We ask you to please sign up if you can or pass this along to friends or family that you many have that reside in the Capitol Hill or East District neighborhoods. Remember, this doesn’t obligate you to volunteer, The City just wants us to be able to show the community commitment we have. If you are not able to help when the time comes we totally understand! Just checking in on some amazing work done earlier this year by our friends PSAA down in Portland. PSAA is Portland Street Art Alliance, an awesome organization working for the advancement of street art and doing some amazing things down in PDX. Last spring, Portland Street Art Alliance and two local artists, The Lost Cause and Jon Stommel, successfully completed a community-funded mural on the backside of Music Millennium (3158 E Burnside). The artists worked with Terry Currier, the owner of Music Millennium, to create a design that would be reminiscent of the record store’s psychedelic roots. They decided on a colorful Beatles-inspired array of happy characters and swirling patterns. Here’s our new video documenting some of that creative process!